The palace and the streets are separated by a mere gate. In Los Angeles, Talesai which serves royal palace-style (or close to it) Thai cuisine, is conjoined by Night+Market, serving street food from North to Southern Thailand. To say that they're neighbors is an understatement. 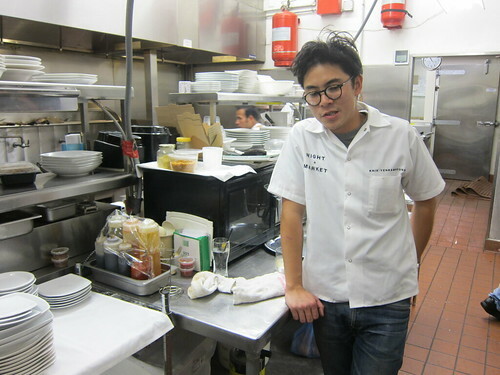 Talesai and Night+Market actually shares a kitchen and 28 year old Chef Kris Yenbamroong, the son of the Talesai proprietors. 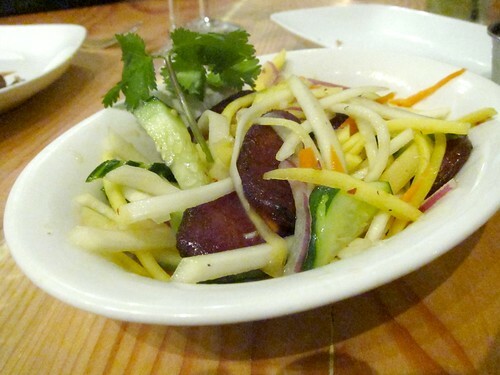 Fooddigger recently organized a tasting dinner for bloggers (as a disclosure, while the dinner was not free, the price was heavily subsidized) and we got to try a selection of dishes - some we've seen before, and others completely new, like the Isaan sour pork sausage, made in-house. The night started at Talesai's bar while we wait for the others to arrive. 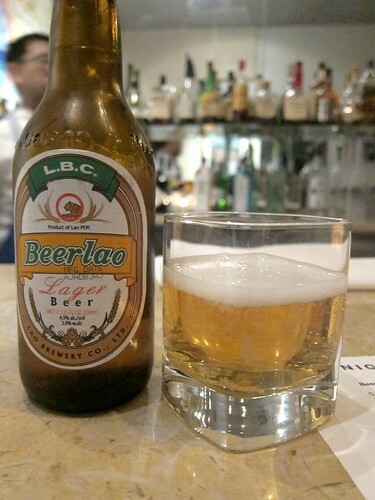 I've always been curious about Beerlao, the rice-based lager from Laos, so I decided to try it. I guess I'm just no beer expert as this tasted pretty similar to other lagers to me. It's crisp and light and easy to drink though. 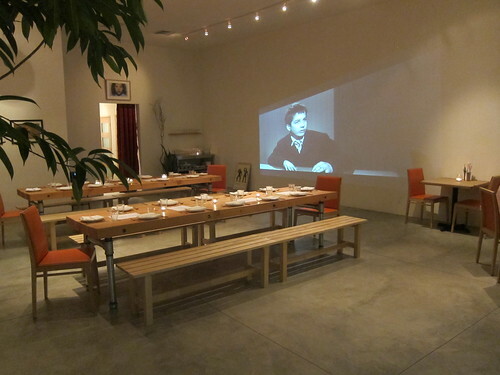 The space next door is bare, and an old French film was playing projected on the wall. Almost felt like an art space. The waitstaff is minimal and they're probably not used to serving such a big group as ours (we had about 20 people), so there was a bit of confusion as to what wine was supposed to go with what dish. The first 4 dishes were paired with these two wines: Cava, Bodegas Barcino, Spain and 2007 Gewurtztraminer, Allimant Laugner, Alsace. 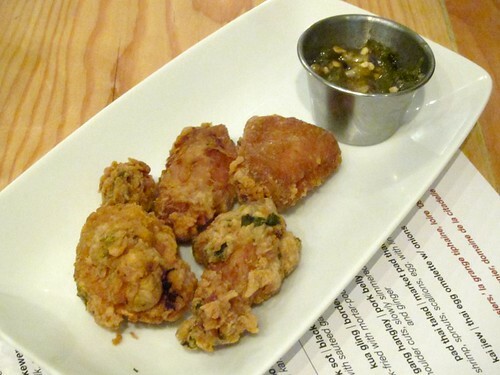 The chicken wings were crispy but the attention should be given to the accompanying chili sauce. 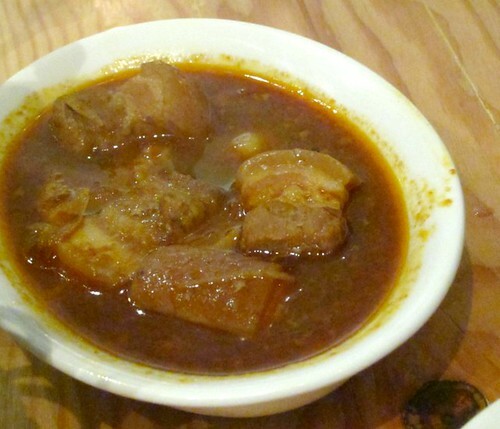 Pork and condensed milk? Soaking awesome in awesome. The sausages weren't as fatty as lap cheong but certainly had the familiar taste. The fattiness goes nicely with the tart mango and papaya. These were some pretty amazing slices of pork. 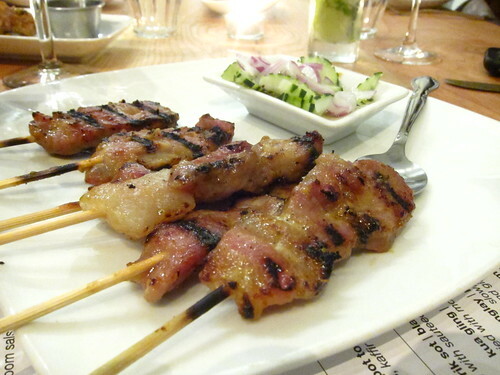 Meaty yet fatty and tender. Unlike pork belly, it still had a nice bite. This actually paired pretty well with the sweet gewurtz, although there was an acidic aftertaste to it. The sausages surprisingly really were sour; such an interesting and unusual taste. They were a little greasy but the cabbage helped cut it. A dish familiar to most, I'm sure. 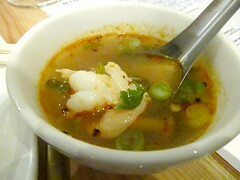 Still, everyone loves a good bowl of tom yum soup. 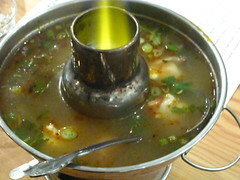 Delicious over some white rice - even when the meat was gone, I can still eat the rice with the broth alone. 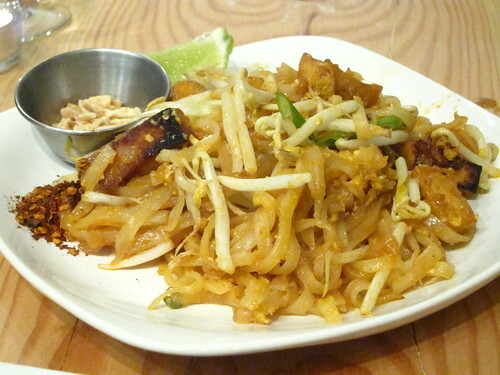 Yenbamroong explained that since pad thai is so popular in America, people think it isn't authentic Thai food, but in fact it is and one of the most popular in Thailand. More dishes came. 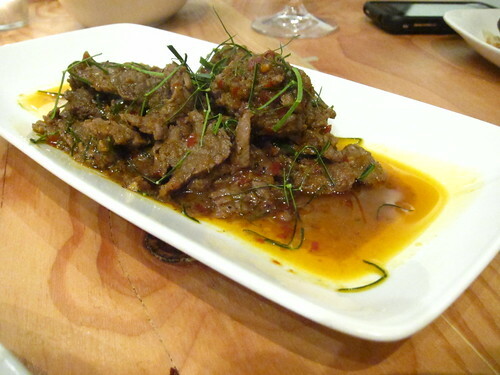 The border beef (top picture) was tender and slightly spicy. It paired well with the 2006 Cotes du Luberon, Le Chataignier, Domaine de La Citadelle. 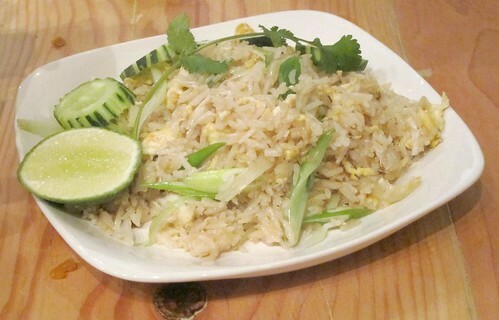 The Kai Jiew (thai egg omelette with onions) was fine but forgettable among the other dishes. For someone who still can't handle spiciness at the level of Jitlada's dry curry, Night+Market offers some interesting Thai dishes I hadn't seen elsewhere that I can still enjoy without killing my tongue. 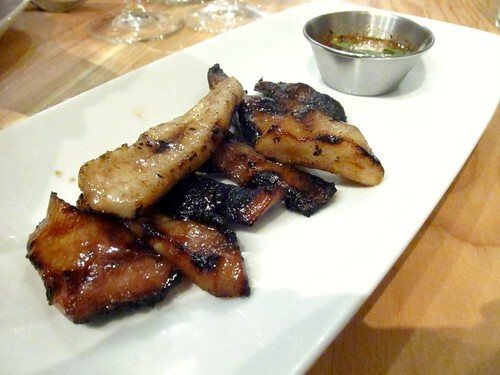 Grilled pork collar? Yes, please. 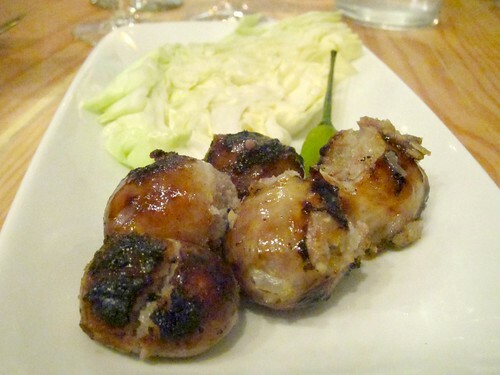 Unlike most Thai places which serve big portions, this is a good spot to share some small plates with friends. The prices are reasonable from $5 for small bites (like the sour sausage) to $16 if you want the curried crab. 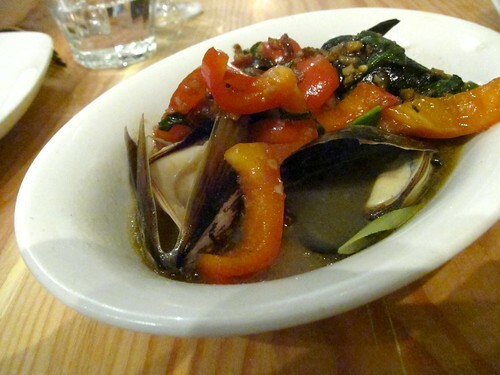 Sounds like a heavy meal, but the Hoi Prik Sot looks delicious.